This creamy pudding looks super sugary and unhealthy, doesn’t it? Luckily looks can be deceiving and this glorious pot is actually completely free of any added sugar and packed with nutrients! 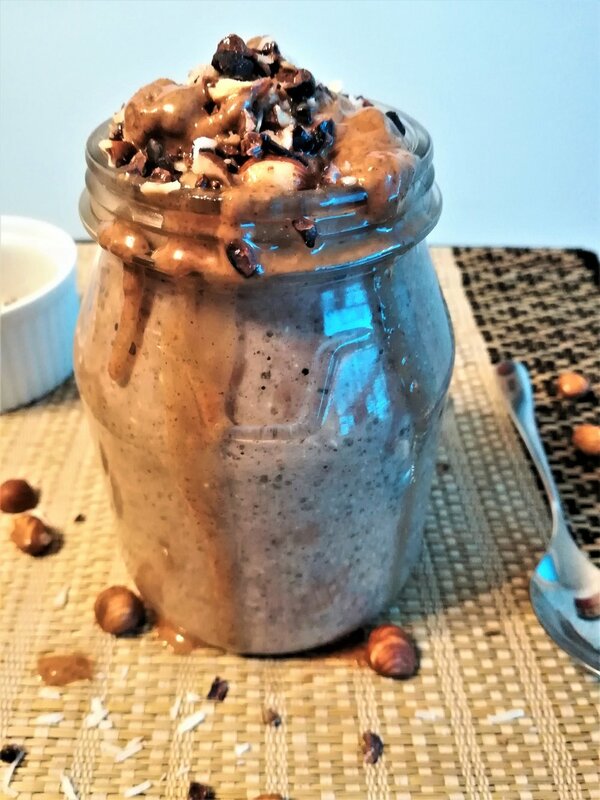 One cup of it will give you 16% of your daily protein, 42% of fibre, all of your daily Omega 3, 40% of magnesium, 20% of zinc and 50% of daily vitamin E.
Transfer almond milk, banana, chia seeds, 2 heaped teaspoons of almond butter and cacao into a blender and mix until you get a very smooth texture. Transfer the mix into a glass jar or 2 cups and put them in the fridge for 10-15 min. Then top the pudding with a mix of crushed nuts, 1/2 teaspoon of almond butter and shredded coconut and enjoy!